Arriving on Mahe, the birding begins with a pair of Seychelles Kestrels sheltering from the drizzle on the rafters inside the open plan airport building! Meanwhile the airport café clientele includes Common Mynas, Barred Ground Doves and a Madagascar Turtle Dove! After the long haul flight to The Seychelles, it’s a short ‘hop’ across to Praslin in a nineteen seat Twin Otter, just like the one I used ten days earlier from The Isles of Scilly to Exeter! Today’s scheduled trip to Aride has to be postponed due to a rising swell and so we take a bouncy boat ride to Cousin instead. Greater Crested Terns are fishing along the shore as we board the boat on Praslin and we arrive on Cousin just in time to see a Hawksbill Turtle leaving the beach after ‘nesting’ in the sand under the trees. These trees are full of Lesser Noddies and delicate Common White Terns and there seems to be a White-tailed Tropicbird nesting beside every large tree buttress. The rare Seychelles Warbler is next on the list, followed by several very tame Seychelles Magpie Robins, which relish the chance to search for grubs in the leaf litter disturbed by our feet. A pair of really smart Seychelles Blue Pigeons shows well in a tree beside the trail which leads up the granite slope, past several incubating Wedge-tailed Shearwaters, to a viewpoint with a stunning vista across to nearby Cousine. There are masses of seabirds flying around including Bridled Terns and Brown Noddies and by now the morning has also flown by and it’s time to return to the beach for a barbecued lunch, with numerous Seychelles Fodies also tucking in to the garlic bread! Meanwhile, four spectacular Giant Tortoises are grazing on the ‘lawn’! What an amazing place. No wonder a BBC film crew has arrived for a two week shoot just as we are leaving! A Terek Sandpiper on one of the beaches on the short drive back to the Villas is a nice finishing touch to a superb day. It’s far too breezy first thing, so the trip to Aride is postponed again and we head inland to the Vallée de Mai in the heart of Praslin National Park, a UNESCO World Heritage Site thanks to the unique Coco de Mer palm which produces the world’s largest seed, weighing in at up to 44 pounds, after ripening for 6 – 7 years! We scope one of the large Seychelles Fruit Bats, with a lovely ginger coat, hanging around at the vallée entrance, as Seychelles Swiftlets zoom back and forth and several Seychelles Black Parrots fly over. Inside the cool palm forest our excellent guide Gemma points out five different endemic species of Gecko. There are two green ones; Sundberg’s Day Gecko and the smaller Seychelles Day Gecko, and three brown species in a range of sizes; Dwarf Bronze-eyed, Seychelles Bronze-eyed and Giant Bronze-eyed, which is the world’s largest Gecko! The Seychelles Bulbul also shows well deep in the forest and back at the entrance we scope the Seychelles Blue Pigeon and watch a Seychelles Sunbird feeding on nectar from Star of Bethlehem flowers. A short walk up the road leads to a viewpoint over the forest which provides views of several Black Parrots, perched close enough in the scope to reveal that they are actually chocolate brown, especially when one lands in the tree right above us! Another great result. This afternoon, we stock up on drinks at the shop next door to our villas where the shopkeeper throws breadcrumbs to create a feeding frenzy amongst the dozens of bright scarlet Madagascar Fodies, with an unusual yellow variant amongst them. As the sun sets behind Cousin there is an amazing glow in the evening sky. What a way to spend a birthday! We’re on the 9am ferry to La Digue with plenty of Lesser Noddies and the occasional Bridled Tern on the crossing. From the bustling jetty, a truck takes us the short way to the ‘Veuve Reserve’. 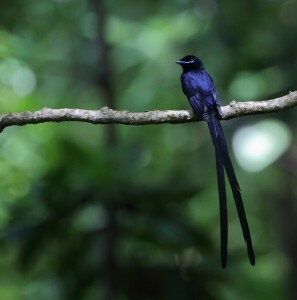 This is the home of the Seychelles Paradise Flycatcher, one of the world’s rarest birds, and some of us are still queuing for the loo when a female is spotted building a nest right behind the information centre! After a short wait everyone enjoys good views of this attractive bird as she makes repeated visits to her delicately woven nest, hanging from a slender twig. Each time she arrives, she sits in the nest while weaving hair-thin fibres into the rim of the cup. A short stroll into the reserve soon brings us to a showy male with a spectacular double pronged tail twice the length of his body, and when he perches on a low branch the dappled sunlight brings out his lovely indigo sheen. With the target bird well and truly in the bag, we enjoy a lazy afternoon on the beach at Source D’Argent amid the palm trees and impressive granite rock formations. We still can’t land on Aride today and yet the plan B crossing to Curieuse on a massive millionaire’s catamaran is a very smooth crossing. Anchored just offshore from Curieuse, we jump in to the clear blue water with snorkels and enter a psychedelic world of tropical fish in a myriad of shapes and colourful patterns. After lunch on board we go ashore and say hello to the friendly Giant Tortoises which love being scratched and pampered. There are also plenty of Turnstones running around on the short grass and we find our first Lesser Sandplover. Exploring the mangroves, crawling with Giant Land Crabs, we spot Striated Heron, Greenshank, Grey Plover and Whimbrel and then sail back to Praslin. After five nights at the lovely Villas de Mer it’s time to fly back to Mahe and onward to Bird Island where we land on a grass airstrip. On arrival it’s immediately clear why this is called Bird Island, as there are literally birds everywhere; thousands of them, including incredibly tame Brown and Lesser Noddies and Common White Terns, on the ground, in the trees, and in the air, creating a cacophony of wheezing, squeaking, trilling and cackling, by day and all through the night! 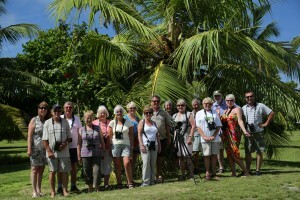 After lunch at the lodge, with Barred Ground Doves on the tables and Turnstones squabbling for bread with Madagascar Fodies and Turtle Doves, we head out to explore this amazing island, which is crawling with Moorhens, even though there is no freshwater. At the north point, a variety of shorebirds includes Greater Crested and Saunders’ Terns, Grey Plover, Greater and Lesser Sandplovers, Turnstone, Sanderling, Whimbrel, a vagrant Ruff and a couple of strange-looking Crab Plovers with long legs and stonking great beaks. Next we head for the Sooty Tern colony where the young, with an attractive white spotted pattern on black, are almost ready to fly. Also in the colony are four Curlew Sandpipers and a trio of Pacific Golden Plovers, with hundreds of awesome Great and Lesser Frigatebirds coming in to roost along with a white morph Red-footed Booby. We finish up at the airstrip where a couple of Collared Pratincoles have come in to land miles from anywhere, while a Giant Tortoise is digging up the airstrip to lay her eggs! It’s just another day in paradise and a chance to soak up the fabulous Bird Island experience; stroking the Giant Tortoises, watching a Green Turtle emerge from the sea to lay her eggs, snorkelling with all the multi-coloured tropical fish in the crystal clear warm blue water, swimming in the surf or just relaxing on the beach. And then of course there are always the birds. By now we have seen seven different Terns here including Brown and Lesser Noddies, Saunders’, Great Crested, Bridled, Sooty and Common White Terns. After a magical time ashore we must fly back to Mahe while Bird Island dwindles to a tiny speck of land in the deep blue Indian Ocean. Back on Mahe we just have two target birds left to see, the endemic Seychelles White-eye and Seychelles Scops Owl, and local guide Perley is here to help. After a series of tight hairpin bends we arrive at a cluster of houses up in the forest-clad mountains with Fruit Bats, Blue Pigeons and White-tailed Tropicbirds gliding around above the canopy. Perley lines us up next to a small twiggy tree, calls in the White-eyes and eventually we all get a close view of this tiny rare bird. This just leaves the rare Scops Owl, the biggest challenge of them all as it’s a small owl which only hunts after dark in the tall dense highland forest. Perley works hard at several hotspots in the forest but the best we get are fleeting flyovers above the trees. It seems the ultra-bright full moon, casting strong shadows, is not conducive to star appearances by this elusive little owl. Nevertheless it has been a wonderful time in paradise with some unforgettable memories from six different islands, and along the way we have seen several of the world’s rarest birds.